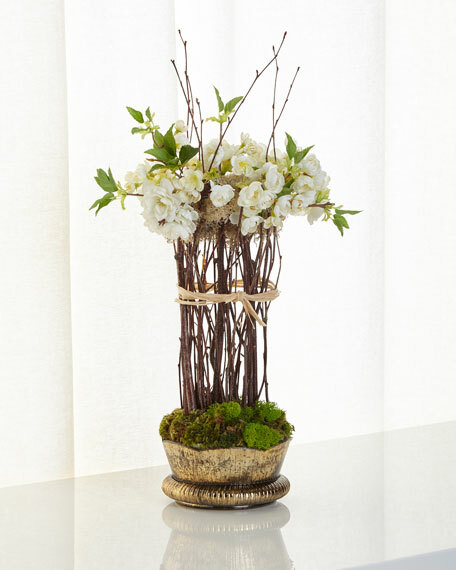 A tall, airy topiary of faux cherry blossoms and birch branches. 12"W x 8"D x 22"T.
Crafted of polyester and silk stems and natural birchwood. Stands in a weathered, goldtone-finished glass pot with a bed of moss. EXCLUSIVELY AT NEIMAN MARCUS This outstanding rose ball topiary of white roses, with a slight green touch, provides a narrow yet exciting design. Handcrafted. Ceramic vase: 6.5"Dia. x 5"T. Florals: polyester/silk and natural botanical. Overall: 9"Dia. x 24"T. Made in the USA of imported materials. EXCLUSIVELY AT NEIMAN MARCUS A handcrafted arrangement of succulents have been finished in gold and rest upon a mound of gold marble rocks in a glass container on a black wooden base. Polyester florals. 28"W x 8"D x 8"T. Made in the USA of imported materials. 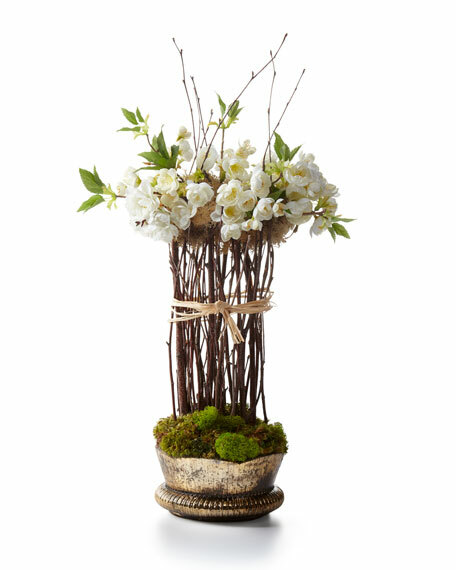 EXCLUSIVELY AT NEIMAN MARCUS Handcrafted phalaenopsis orchids stand tall in woven brass wall basket. Ironware basket. Polyester/silk florals. Natural wild cane accents. 32"W x 14"D x 30"T. Made in the USA. Boxed weight, approximately 13 lbs. EXCLUSIVELY AT NEIMAN MARCUS Handcrafted faux floral arrangement. Dancing small orchids stand proudly in a cut crystal vase surrounded by orchid leaves. Faux silk; polyester stems. 19"W x 17"D x 30"T. Base: 7"Sq. x 4"T. Made in the USA of imported materials.